I chose white jeans because of the naval heritage of the double breasted blue blazer. The whole was worn with horse bit loafers, which I come to appreciate more as I age. The gold bit echoes the gold buttons of the blazer. They are “very Richmond” though. Our former parish priest used to wear them, without socks of course, under his cassock. It never failed to amuse me at Communion. 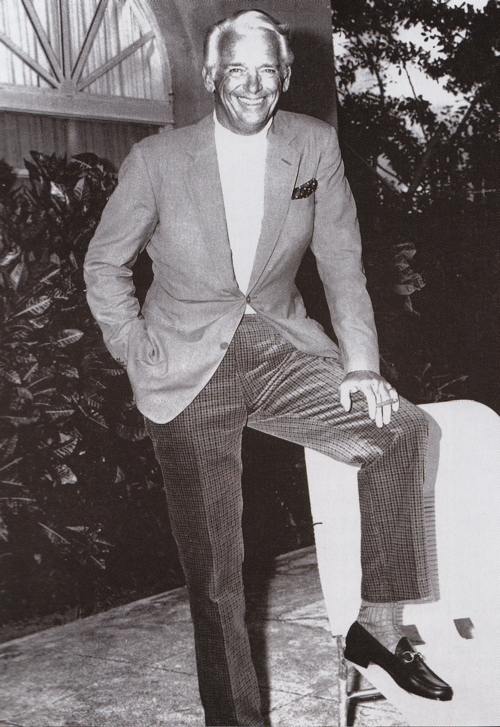 I know that many consider the horsebit loafer “naff,” but take a close look at the photo of Douglas Fairbanks, Jr. from Alan Flusser’s “Dressing the Man: Mastering the Art of Permanent Fashion ” … and that was a fellow who knew a thing or two about high wattage style. High wattage being the operative term, they do stand out thanks to the metal bit. Gucci did one with a bamboo bit, which I think would make for a perfect summer shoe. I’m off for a PET scan today, so I may not have time to answer comments immediately. But I look forward to them nonetheless! This entry was posted in Elegantology and tagged "Dressing the Man", Alan Flusser, Alden Loafers, Belgian Shoes, Douglas Fairbanks Jr., Gucci Horsebit Loafer. Bookmark the permalink. Douglas Fairbanks, an icon of a bygone era! Mr Fairbanks got away with wearing a white polo neck because of his silvery hair colour. I’m intrigued by his trousers. I don’t know what sort of material it was made of. I love his shoes too. I have a similar pair, an Italian made, a real leather. But I can’t wear them without socks as I fear I will have blister. Bit loafers are de rigueur in Greensboro. Black bit loafers are my default travel shoe as they can be worn with jeans, khakis, flannel trousers, blazer, suit, Birdwell’s or shorts by the pool. I even wear them with my tuxedo – but only when traveling. Excellent post! C….Belgian does a hard soled-more substantially constructed version of the Mr. Casual. Not my thing but it’s a hybrid worth looking at. I have 3 pairs of Gucci Bits ….Black Suede…my only pair of black shoes. Palomino tan with gold bit and an old pair from Europe with the green/red cloth insert beneath the bit/vamp. What in the world causes you to need a PET scan? Migraines? You put it out there so I have to ask. We’ll say a prayer for you tonight. Hello ADG, two time Cancer survivor. This is the price I pay for NOT having to deal with chemo or radiation treatments. Not too bad a deal! But they were a little rough with the needle extraction today and I can’t get too near the children until tomorrow. Does Belgian do a suede lined/unlined version? I would prefer it when sockless. I live in Tod’s (cocoa suede, camel leather, and green – yes GREEN – suede) when not at work. Ferragamo or Gucci bit loafers are in the rotation as well. I definitely am fiending for a pair of Belgians. Fairbanks looks decent here from the waist up – his choice of shoes and trousers are equally off, IMHO. Little shiny bits of attention grabbing metal should not appear on a man’s shoes – unless, of course, he’s a Pilgrim. I love my Alden shell tassel loafers, but bit loafers – to me – appear mildly effete and very gaudy. I’ve never seen someone wear bit loafers where tassels or penny loafers wouldn’t have looked better – especially with suits; I really hate bit loafers with suits, which I see all too often. Everyone’s entitled to mistakes and wearing bit loafers and those seemingly velvet pants was one of Fairbanks’. He looks like what I would assume a gigolo to look like. You speak of the blazer buttons and the shoe hardware relating to each other. It is amazing how if you match your ring, reading specs, pen, belt buckle, and possibly the hardware on your loafers, how beautifully put together one looks. I have a beat up old Eddie Bauer belt with a fine brass buckle, and when I wear it with a gold signet ring, gold frame specs, and an ancient Cross gold pen, it looks elegant but not formal. It really makes a tremendous effect, even if the items are not necessarily expensive, but carefully chosen for simple lines. I love all the classic loafers, but when I was a teenager in the 70s, I had a pair I wished I had saved. They were classic beef roll style loafers, but over the instep was an antique coin or medallion, rather than the slotted piece of leather on the classic Weejuns loafer. I would love to find classic penny loafers in unusual colours such as pastels (powder blue!) for summer, or black patent leather for an evening. Or perforated bone or white leather for summer. Men’s leather shoes (not souped up athletic shoes) are so very limited in colour…so much black and brown. Overstyled shoes look affected on a guy, but you can get away with a shot of colour if it is done on the most classic shoe. I hate Tods because they are overpriced and the nibs lack any durability, and cannot be replaced. Tods driving shoes give a graceless flat footed walk. I recently dissected a vintage Gucci product for the hardware, and found it incredibly cheaply made. In fact anything that looked like leather was actually synthetic. Really, the classic American loafer is better made and much more reasonable, although I do think the horse bit hardware is cool and has the wonderful sporting life/ equestrian associations. You can actually buy those decorative metal horse bits at sewing/ notions stores, and affix them with leather tabs (very simple) to all sorts of things…jean jackets, simple loafers, handbags, portfolios etc. I don’t object to paying for quality, but I hate overpaying for something that is inferior and commands a high price because of the name. Notice how one rarely sees monarchs, aristocrats and politicians wearing logos? After all, what is more important, the person, or the designer they are wearing? Wearing obvious logos is bad. Wearing obvious logos on accessories that are of poor design and/or quality is intolerable! I can never get espadrilles to fit or look right…always sloppy. Is it true they should be somewhat snug at first as they stretch? Favorite ladies’ loafers–a pair of (then-called) J.P. Tod’s brown suede loafers with a great reinforced rubber sole, no nibs, more traditional than their driving mocs. Also own two pairs of Gucci suede loafers, brown and black, both with bit. I don’t like them as well on men, especially the leather ones–but I like a tailored “menswear” sort of shoe for myself. When Tom Ford first arrived at Gucci and really re-energized the house, he designed a fabulous platform Gucci loafer! I know it sounds weird, but it is a fabulous, chic shoe–black suede with the bit, platform sole and a 3-4″ heel–very ahead of its time! I think it was the early 90’s? Still love that shoe, but can only wear it for about an hour and a half. SwF, get the espadrilles that feel too tight. The cotton stretches fairly quickly. If it really bothers you, push down the backs and wear them as slides until the stretch. They become my summer slippers. I am lamenting the striped pair that recently gave up the ghost. E-Man….I have a long prayer list that LFG and I consistently honor. I’m so pleased to know that I can offer in prayer-thanks that you are still here-that you are surviving and that your elan and approach to life is I know, grounded in such gratitude. Belgians…only unlined. God bless you E.